This month was one of the most eventful we've had in a long time and included the infamous BIG hole! In March we had a visit from Stuart Timson, the Conservation Director from Peru. His help in digging THE hole was greatly appreciated as well as some advice on streamlining our various projects. 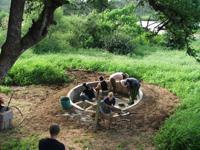 Our main project this month was to start and finish a new waterhole. Water is one of our most important management tools on the reserve. By controlling the duration of water availability at the various waterholes, we can "move" animals around the reserve and thus ensure that the areas around them don't get over utilized. This meant digging, more digging and yet more digging! Everyone pulled their weight and endured back aches as well as getting a really good tan in the process. The occasional interruption from thirsty elephants made the operation just the more enjoyable. Another project we worked on this month was the start of Matt's new greenhouse. Part of our new initiatives is to start a riverine forest recovery project. The large number of Elephants in our area has had a serious impact on the vegetation and has caused the local extinction of various tree species as well as some threatened plant species such as Hoodia spp. We should be finishing it pretty soon and are already in the process of collecting seed and saplings. We have started looking for ideal positions for a new proposed observation deck along the Limpopo River. Thanks to the generous donation from Eike, one of our volunteers, we will construct this deck with a name plaque in recognition. Our bird observations for the "Birds in Reserves Project" (BIRP) has been very successful as many new species have been noted. Stuart caught a very elusive and not that easy to identify Button Quail on a night drive which was an uncertain species up until now. As yet we still haven't seen Leopard (Panthera pardus) but still get their tracks all over the place. We are planning on starting a database of all their tracks and so try and establish the density of leopard on Legodimo. The Limpopo River has slowly started subsiding and river crossings in to South Africa are now less hair raising. Our resident hippos are still over the moon due to the abundance of grazing and water and accentuate many sunrises and nights with their characteristic call. We are all very excited for April and will miss Stuart this month.